One unfortunate aspect of aging is that living independently can become more difficult. What are some of the warning signs that your mom and/or dad may need assistance? 1. BRUISING: Older skin bruises more easily and they may not be telling you that they are experiencing falls, bumping into things, or have become increasingly unsteady. A medical checkup and a cane or walker may be in order. 2. FOOD CRISIS: An unexplained weigh loss that isn't the result of a health issue may be an issue with food accessibility. Check the refrigerator and cabinets. Unkempt food storage areas with ruined food, or a noticeable lack of food, may flag trouble in self care. Parents may be unable to clean or shop like they once did. Getting help with household chores, shopping, or meal preparation may be in order to be sure that healthy, fresh food is available while extending their ability to safely age at home. 3. UNPAID BILLS: Your parents may not be able to tend to paperwork and bills as they once did. You may discover piles of unpaid bills, cutoff notices, or even cancelled services. 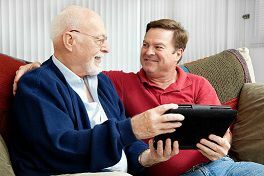 Ensuring that vital services are uninterrupted is essential since even a short loss of utilities can have an immediate and life-threatening result for older individuals. Helping them set up automatic bill payments, assisting them with bill paying once a month or hiring a bill paying service will eliminate this concern. 4. ODOR: If the house has an unpleasant odor, it could be the result of rotting food, the inability to clean and dispose of trash, a difficulty with hygiene or health issues that have gone undiagnosed (like a urinary tract infection). Track down the cause of the odor to determine what steps need to be taken to keep things safe at home. 5. HOME IN DISARRAY: Everyone's house is messy from time to time. However, as it becomes more difficult to move around and do regular household chores, these messes may become bigger. They should never progress to the point of creating health or safety issues. Consider hiring a cleaning service or an organization expert before things become too overwhelming. Let your parents know that you don't want to intrude, but you are genuinely concerned for their health and safety and want to help them find solutions that help them stay in their home longer and remain safe.